I have to admit, I’m not a big fan of sci-fi, dystopian fantasy or anything involving star-crossed fairies. 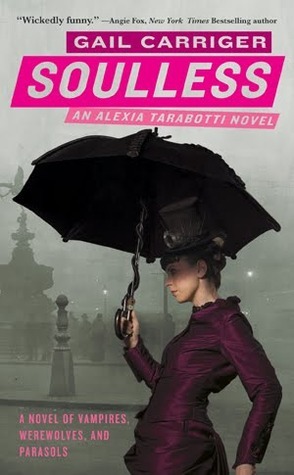 When I first read the dustcover of Soulless, I was immediately turned off by the whole steampunk thing. But it was on sale for $5, so why not give it a try? And wouldn’t you know, I was immediately sucked into Alexia Trabotti’s world of vampires, werewolves, dirigibles and mad scientists! Although fanged and furry creatures of the night coexist with humans in this odd realm of Victorian London, many people (scientists especially) are weary of their supernatural powers. That’s why Alexia must keep her soullessness under wraps. Known as a “preternatural,” she has the unique ability to rid a supernatural being of its powers with just one touch. It’s bad enough she’s a spinster with an unsightly Mediterranean complexion, let alone a lack of human essence! Plus her wisecracking comments are typically frowned upon in polite London society. The story begins when Alexia accidentally kills a rogue vampire with her trusty brass parasol at the Queen’s ball. When Lord Maccon, a gorgeous Scottish alpha werewolf, is sent by Queen Victoria to investigate, he comes up with more questions than answers. What’s behind the random vampire attacks? Why are vampires disappearing from their hives? All signs point to Alexia, but Lord Maccon is convinced of her innocence and soon grows a fondness for her ballsy attitude and curvaceous physique. There are many things I love about this book – whip-smart dialogue, screwball comedy, smoking-hot make out sessions, to name a few. But I really got a kick out of the secondary characters, especially Alexia’s best friend, Ivy, who has a huge collection of hideous hats. Alexia’s zingers about her friend’s ridiculous fashion statements had me laughing out loud! I also love, love, love her vampire sidekick Lord Akeldama. He’s your token gay best friend with impeccable fashion taste and snarky one-liners. The intoxicatingly witty love-hate banter between Alexia and Lord Maccon is also very entertaining. Gail Carriger has clearly mastered the art of dialogue and character development. I can’t wait to delve into the next book to see what’s in store for Alexia and Lord Maccon as their relationship develops! So my fellow readers, the moral of this story is to try out a new genre! Who knows, you might be missing out on a real treat. After reading the Hunger Games in one sitting, I’m kicking myself for never dabbling into the realm of dystopian fantasy. That review is coming soon! Posted on March 29, 2012 by Bubble Bubble Books and Trouble •	This entry was posted in Adult Paranormal, Romance, Vampires, Werewolves and tagged Gail Carriger, Soulless, steampunk, The Parasol Protectorate. Bookmark the permalink. ← Historical Mystery Series Giveaway! Neat review! Yes, I agree, sometimes we find treasures where we least expect it. I’m with you, not a big werewolf, etc fan–but this sounds delightful! Will have to check it out. Thanks Sylvia! It’s a little out there, but you’re guaranteed to laugh. The characters are the big selling point. Hi Laura! Yeah, I’m not all too enthused about post-apocalyptic futuristic stories involving dystopian warriors, but the Hunger Games trilogy is sooo good! I’m still not too excited about the steampunk genre, but these books are really addictive. The writing is top-notch and the characters really crack me up!